The place is Scotland, the year is 1828. As our narrator, an affable executioner (Bill Bailey), informs us, the locale is in the midst of something of a medical renaissance. Even faster progress might be made in the pursuit of medical knowledge if only there were more cadavers to dissect, but alas only the bodies of executed criminals may be used for medical study, and there just aren't enough people being executed of late. That trickle all but dries up for Dr. Knox (Tom Wilkinson) after his rival Dr. Monro (Tim Curry) finds a way to get all the corpses for himself. Stepping in to meet the demand are a couple of Irish scam artists by the name of William Burke (Simon Pegg) and Willaim Hare (Andy Serkis). The first corpse the pair sells died of natural causes, but when finding another fresh subject proves difficult, the pair resorts to murder with little hesitation. BURKE AND HARE begins with the statement that, “This is a true story. Except for the parts that are not.” That's usually the case with any film that purports to be “based on a true story”, but I do admire the filmmakers' forthrightness in this case. And indeed, a great many of the factual details have been changed. I just don't quite understand why. Normally if you're going to tinker with a true story, it's to juice up the action, make the story flow better, and/or emphasize particular themes and ideas the director wants to focus on. The changes co-writers Piers Ashworth and Nick Moorcroft have made, however, feel arbitrary. The film is clunky and dull, with various subplots like one about Burke's girlfriend Ginny (Isla Fisher) trying to stage an all-female performance of Macbeth shoehorned awkwardly into the script. There are also attempts to have fun playing fast and loose with history, like inserting Charles Darwin into the action (he did attend classes under Dr. Monro at about the time these events took place) and giving a fictitious account of the invention of photography. 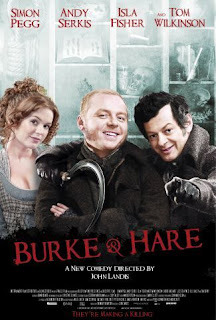 At just 91 minutes, BURKE AND HARE can't really afford the luxury of going off on tangents like these. And yet again and again, that's what the movie does, to the point that we barely get to know our main characters. I generally enjoy both Simon Pegg and Andy Serkis in just about anything they show up in. Here, however, they barely make an impression. You can tell they're trying their best, but they just don't have much to work with. Why John Landis chose this to be his first feature film since 1998's SUSAN'S PLAN I don't know. Based on the cast and production values, he obviously thought he had something here, as this is no cheap B-movie but an obvious attempt at a comeback. Maybe the fault lies in the editing, a process that has destroyed many a good film. Given all the various subplots, another 30 minutes added to the running time might have made all the difference. But unless all the jokes wound up on the cutting room floor, the biggest problem with this would-be black comedy still remains: it just isn't that funny. Last year's straight to DVD I SELL THE DEAD did far more with the grave-robbing comedy premise on a much lower budget. 2 out of 4 stars.